One of the writers I admire most is Judith Martin, better known as "Miss Manners." Sometimes, though, she reminds me of a conversation I once had with an intelligence professional, which began with a question about what connotations I thought the word "manipulation" had. Were they negative? I was especially annoyed at my neighbor who was complaining to me about this two days ago -- and just yesterday her daughter went into my cooler and took out my container of grapes and brought them over to my lounge chair and began eating them. Her mom said "Susie, no" and the little girl just laughed and said, "But I like them" and continued to eat. I was so annoyed that I didn't know what to do, so I turned to my husband and asked if he would like to go swim with me. As I said, we are friends, and our kids play together, but this is getting old. It is not a matter of not being able to afford it, either, because most of our neighbors live a much higher lifestyle than we do. Please help me know what to say without making enemies out of my neighbors! The neighborly thing to do would be to show concern for the children and organize the parents to do something about it. "The children always seem to be hungry at the pool," you can tell them. "Should we take turns bringing them snacks?" Miss Manners does not expect such an enterprise to be the result. Rather, some parents will say that they don't want their children eating between meals, and others will argue about what they consider to be proper snacks. This will empower you to say, the next time some child tries to help himself, "No, dear, I'm sorry, but your parents don't want you to have that." An elegant solution -- a diplomatic one, even. Manipulative, however, from conception. So, an ethical question: Is manipulation a virtue? Under what circumstances? What are the necessary constraints to keep it from becoming vicious rather than virtuous? Obama has done nothing but talk, and hasn't updated his concepts on Iraq since 2006. "Will we lift the child in Bangladesh from poverty, shelter the refugee in Chad, and banish the scourge of AIDS in our time?" Twice, apparently. As for the scourge of AIDS in Africa, I'm not sure how much Sen. McCain has done, but Bush has done quite a bit. It seems to me that we are starting to be a little more open and truthful about these matters. Columnist Chris Satullo in the Philadelphia Inquirer back in May pointed out that the charges of "elitism" then being hurled at Barack Obama were really about smarts. The charge of elitism isn't about people flaunting income; it's about people flaunting IQ. Americans, as a rule, don't resent people who have more money than them — particularly if the wealth is seen as earned. Envy, maybe, but not resent. You don't resent people whom you hope to emulate. And most Americans dream easily about having much more dough than they do. What Americans more readily resent is someone who is smarter than them, who knows it, who shows it, and who seems to think being smart makes you better than everyone else. A gap in income, you can always dream of closing. A gap in IQ, not so much. It's more personal, thus easier to resent. I never thought Sen. Obama was all that smart. He doesn't come across as being particularly intelligent -- certainly not stupid, probably above-average, but I've met some real geniuses in my time, and he is not among them. He has a Harvard education and has been given positions of academic honor, but has produced no scholarship of note. His prose is forgettable; it sounds good at the time, but no idea is so clearly expressed and insightful that it stays with you. If he meant any of it, he might think deeper and come up with better lines: but in general, he strikes me as someone of reasonable but not shocking intelligence, who has a talent for speaking but nothing worth saying. I've never found intelligence worthy of resentment: admiration, rather. If I resent anything about Sen. Obama, it's that he's risen so high on so little actual accomplishment -- I don't even resent that he's done it on so little work, since that's a sort of accomplishment in itself. 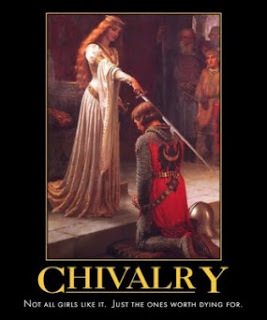 It's just that nothing he's turned his hand to has prospered; no one who has befriended him, except his fair wife, has gained the honors that friendship rightly earns. Yet he rises on, ever, with those in his trail forever disappointed, wondering why he promised so much and then left them behind. This is the clear message of the Boston Globe's piece on the slums his housing efforts produced, and the New Yorker interviews with those who used to work with Obama in Chicago. It is the clear message also of his relationship with the preacher who sponsored him in Chicago politics, and his grandmother (and indeed, answering Hitchens, I can quote a line from his speech on race from memory: that line. It is the one he made memorable, by his deeds). No, what bothers me is that no one seems ever to have stopped him and said, "Fine -- but before you advance again, tell us: What have you done?" UPDATE: I have deleted a paragraph here, because on reflection it distracts from the discussion of the concept of Derbyshire's piece, which is the interesting part. UPDATE: According to Steve Sailer, John McCain tested at IQ 133, which is not bad. (Assuming standard distribution, it would place him in the top few percentage points of humanity. It's also more than "two standard deviations" above the mean IQ of 100. If Derbyshire were right, that would mean Sen. McCain was too intelligent to communicate effectively with the majority of Americans -- if you add up the ones right at 100, and the ones below it, it would only be the most intelligent Americans who could understand him. Sen. Obama, being a famously great communicator, should sit lower on the curve according to that model: somewhere around 120 would be optimal, as it would allow you to be intelligent enough to communicate well with the most intelligent (up to around 150, which is close to everyone) as well as the bulk of people sitting from 90-110. I doubt that the model is right, though -- I mention it only because it runs strongly counter to what appears to be the popular impression. Sen. Obama has been accorded an impression of being a serious thinker by the press; Sen. McCain is assumed to be somewhat slower. Yet Sen. McCain is in fact confirmed to be of reasonably high IQ . Sen. Obama's does not appear to be public; I've seen estimates Googling around from 125-148, but they all appear to be SWAGs not based on any actual test results. The higher end results (130-148) estimate off the LSAT, but not Sen. Obama's actual LSAT, which isn't public -- just the median scores for Harvard law. The LSAT is not actually an IQ test, nor is it particularly difficult. These popular impressions about the candidates' intelligence are probably rooted more in our prejudices than in their actual intelligence. As a culture, we think of older people as being mentally slow -- a hostile prejudice undeserved in the case of those who remain mentally engaged and active; in fact, research indicates that intelligence changes with age, but does not necessarily decrease, and may even benefit in some areas. By the same token, we tend to think of Ivy League graduates as being exceptionally intelligent. Yet this prejudice is generally set aside when someone runs counter to our own decision-making process: it would be hard to find anyone who thought George W. Bush and John Kerry were about equally intelligent, though both are members of Yale's Skull & Bones. The normal opinion is that one is a sharp character and the other is a buffoon; but which one is which depends on where your own prejudices lie. As Grim likes to use movies to instruct and inform on morality, this item caught my eye. Andrew Klavan, writing in the Wall Street Journal, has a curious interpretation of the new Batman movie "The Dark Knight". I have not seen the movie, so I can't really comment on Klavan's idea, but any who have, feel free to discuss. One thing I do note about Batman, as opposed to the other superheroes movies are being made about recently--Superman, Spiderman, the Hulk, the X-men, even Hellboy--is that Batman is still, underneath the costume, just a guy. He has no actual super powers, just some neat toys that help him get things done. I wonder if that makes stories about him more accessible than the others on some level. ON THE one hand, I expected some uproar in Ireland over my piece about Ethiopia on July 10. But there really wasn't any. On the other, I didn't expect an attempt to jail me by a state-sponsored body. Yet Denise Charlton, of the Immigrant Council of Ireland, has urged An Garda Siochana to investigate me under a special law, by which I could be tried and imprisoned for two years without even the benefit of a jury. "Garda" is "guard" in Gaelic, obviously a loan word. An Garda Siochana is "The Peace Guard," that is, the police. His competitors at Metro magazine are trying to get him hanged. METRO e-mailed me the following questions. "Do you agree with the charges levelled against you by the Immigrant Council of Ireland (namely that the article can be seen as inspiring racial hatred?) Why/why not? "2. Do you agree that your article could be misunderstood in some quarters? If so then what is the main idea of it and what was it really trying to say? "3. Do you agree that some of the statements you made could be offensive to people from Africa who live in Ireland? Did you think about them when writing the piece? "4. It's definately (sic) not the first time that your writing offended somebody. Can you recall any other instances/ official complaints/death threats etc that you got from, say, the Irish republicans? "That is all. It would be great if you could answer these questions or give your comment in any way you wish. I just want to add that there are a lot of Africans associated with Metro Eireann and they're all very offended." So: do you agree that someone, anywhere might misunderstand what you wrote? If so, would you explain why you would write something that anyone might misunderstand for any reason? Can you recall any occasion you offended someone before now? We'd just like to add that we are deeply, personally offended. Hey, that's a great standard for encouraging freedom of discourse. Have you ever offended anyone? 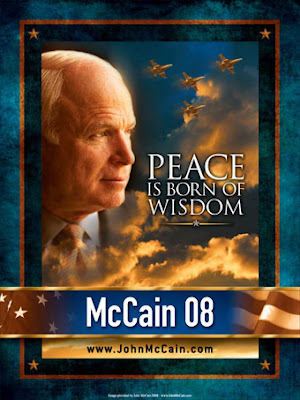 Actually, the McCain one is a really great poster. It frames his age and experience as "wisdom," which is a traditional way of thinking about age: we all hope that we become wiser as we age. It clarifies that his interest in the use of military force is directed at the goal of peace, which is the noble and proper use of force. It has an evocative use of color and shape, and the fighter formation imagery is a commonplace in American politics. 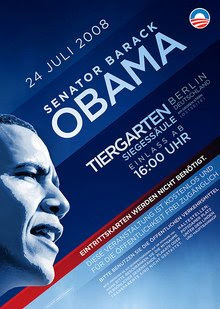 Then again, maybe the Obama one is a really great poster for Germany. I'm not enmeshed in German culture enough to know how it might resonate. I'm not the only one to notice either. Congratulations! You Bought A House! Four Hundred Thousand of them, actually. The effect of this kind of thing is to punish economic actors who are intelligent, careful, and thorough, while rewarding those who are reckless and hasty. As we know, when you subsidize something you get more of it; when you tax something, you get less of it. That suggests that this "remedy" will not be good for the long-term economic health of the nation. The New York Times suffers a massive drop in its circulation, advertising, revenue and profits. Solution? Raise the price of the newspaper. The June performance followed an 11.9 per cent decline in May advertising revenues, and suggested that an already deep erosion in newspaper advertising could be accelerating. Ms Robinson said the company would respond by raising newsstand prices for the New York Times from $1.25 to $1.50 per copy beginning in August, marking the paper’s second increase in a year. That announcement came as the company reported that second-quarter profits fell 82 per cent to $21m, or 15 cents per share, compared with the same period a year ago, when it benefited from a $94m gain from the sale of television stations. One wonders if Mr. Krugman was consulted. We've seen the love affair at length, but give CNN credit where credit is due. This is a technical violation of the Logan Act; although the Logan Act has never in two hundred years been enforced, so it's probably a dead letter. The point tonight is that CNN deserves a huzzah for allowing a clear violation of diplomatic etiquette to be called out as such on the air. One other matter of housekeeping: the other day I was mocking the "Obama One." 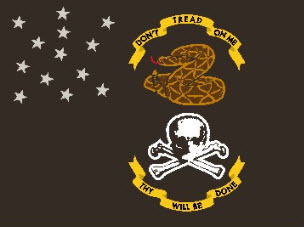 I saw in a report today that McCain has also leased a plane for his campaign, which is apparently also decorated. So -- what we have here is a case of me being ignorant about what is apparently standard practice for campaigning politicians. I apologize for the unfair remarks. Yeah, ok, its the National Enquirer. But. Just wow. It's clear by now that I don't have any brief for the guy. However, just as I defended him a bit this weekend on the grounds of his wife, I'm going to defend him against this psychoanalytic attack. It's from back in March, but just came to my attention this morning. The problem with the "diagnosis" starts with the fact that it's unethical to diagnose people you haven't actually examined -- especially politicians in an election year. However, ethical rules in the field of psychology are 'really more of a guideline.' In 2006, the Sanity Squad debated whether or not they were free to talk psychology about political figures they hadn't examined, and determined that of course they were. It's the public's fault if they mistake such talk for an 'actual' diagnosis. The second problem with it is that every single Presidential candidate gets 'diagnosed' with NPD without examiniation. Sometimes it's laymen doing it, but sometimes it's "real mental health professionals." It happened to Bush, it happened to Kerry, and it happened to Gore. Oh, and people raised the charge about Sen. Clinton. And her husband -- that was what the Sanity Squad got criticized for doing in the first place. What is the evidence this expert fields? 1) "An amorphous expression that looks like a child, about three years old, needing approval. I’ve almost never seen this expression in someone who isn’t NPD (occasionally in Borderline Personality Disorder, a closely related type II personality disorder). To me, it’s an exceptionally good indicator. It’s often a fleeting micro-expression (hard to catch without practice)." So: we are required to take her word for it. If we don't see it, it's because we aren't practiced enough. How do we know who is practiced enough? They can see it! As always with psychology, there is no way to falsify the claim. You either agree, or you're wrong. 2) "The eyes of NPDs usually have an unusual look. My face-reading friend describes them as “dead eyes”. I perceive NPD eyes as “no boundary between inside and outside”. Some people perceive them as magnetic." So: their eyes look "unusual." But not unusual in any particular way. Some people see them one way ("dead"). Others see them in exactly the opposite way ("magnetic"). 3) "The startle response of pupils (e.g. to disturbing scenes) is often diminished relative to normal people (both less of a change in pupil diameter, and a longer lag before pupil size changes). I think people with NPD also spend less time playing through internal imagery (visible in eye tracking and facial expressions)." At last, a falsifiable claim. So, has she measured Obama's pupil dilation, to measure it against "normal people"? Well, no, not as such. Also -- even if she had, it's not telling. The delay is "often" diminished, not always. Nor is it claimed that this is the only potential reason for such diminishment. Most importantly, though, because it is only "often" diminished, a "normal" reading wouldn't clear him of her diagnosis. He might be one of the NPDs whose response is not diminished. So: in theory this is the strongest claim so far, because it could be tested. It hasn't actually been tested. And even if it were, it wouldn't actually prove or disprove the claim. Once again, psychology doesn't deal in science -- if X then Y. It deals in pseudoscience: its claims cannot be falisified. I won't go through the whole thing, but hopefully with these examples you can see how the game works. It's all [redacted barnyard expression inappropriate for public discourse]. I don't doubt that she sincerely believes it, as she sincerely believes she is an "expert" in reading people. The problem is that the "expertise" can't really be put to the test: even when individual claims can be falsified, the diagnosis is untouched. There is nothing wrong with someone going to a psychologist on his own, to seek help for a problem or disturbance in his life. I don't personally believe any of its claims, but just as religion or the martial arts can improve your life, so can psychology in its proper limits: so can a belief in feng shui. Just wanting to feel or do better, and adopting a disciplined method of working towards it, can have positive effects on you. As we discussed with regard to Aristotle and Free Will, the first thing is to adopt a vision of beauty and pursue it. Even if all of psychology's claims and models are untrue in the final analysis, it can still help a willing participant to overcome problems that he identifies in himself. It's not necessary -- a devotion to rock climbing can work as well or better. But it's not wrong, confined to its proper role as an art, participation in which is wholly voluntary. Any disciplined method will do, so long as it pursues a vision of beauty that you personally truly believe. These attempts to use psychology as a weapon against political enemies are not within the proper limits of psychology. Its unscientific, unfalsifiable nature means that no one so accused has any means of clearing himself. This is the same reason it should not be allowed in courts: it is an unfair method of argument because its claims cannot be disproven. No one should be subject to having their fitness for public office questioned because of such an attack. Whether we like them or despise them, they deserve better than this. But what's it based on? 'He's a gift from the world to us.' He is? What's he done? For now, the government is strengthening its earlier precaution against hot peppers to a full-blown warning that no one should eat fresh jalapenos — or products such as fresh salsa made from them — until it can better pinpoint where tainted ones may have sold. Tomatoes currently on the market, in contrast, now are considered safe to eat. The Texas plant, Agricola Zaragoza, has suspended sales of fresh jalapenos and recalled those shipped since June 30 — shipments it said were made to Georgia and Texas. I know we have a lot of Georgia and Texas readers, and a lot of folks who like to eat jalapenos. I love fresh jalapenos: one of my favorite things to do with any food is to chop up a fresh jalapeno and put it on top, seeds and all. Burgers, salads, chili, whatever: jalapenos are great. We grow them in the garden, but they come in later in the season for us, so we may very well have contaminated, store-bought jalapenos in the house. If you may too, here is the USDA's page on how to avoid salmonella-caused food poisoning. Keep them cold, clean them carefully, and cook them through. The USDA has specific guidelines. In the meantime, the cayennes in the garden are starting to come in, so we'll just make do for a while. Mr. McCain, 71, acquired the sobriquet “maverick” about a decade ago. When he was first elected to the Senate in 1986, after two terms in the House, he was in the mainstream of his party. He even made a credible, though unsuccessful, run for a party leadership post. But his popularity did not last. First, there was his “truculent nature,” as he calls it. His Republican colleagues call him aggressive, brusque and abrasive. He later adopted the habit of publicly scolding other senators about their special privileges, from pet spending projects to airport parking spots. What Mr. Lott called his “cuddling up” to the Democrats has further strained Mr. McCain’s relations with Republicans. The piece continues in that fashion: now quoting a McCain supporter, now a detractor. Lincoln Chafee, a Republican, plans to vote for Obama apparently (to read the piece) because he's developed a personal dislike for McCain's 'Naval Academy' style. Russ Feingold, a Democrat, is a friend to McCain and works with him, and says that McCain reaches out to younger legislators in a way unusual for senior Senators. Supporters say he demonstrates actual bipartisanship, not just talk of bipartisanship. Detractors say he has a temper. Supporters say he never runs from a fight on principle. Detractors say that he's stronger with independents and Democrats than Republicans. Something like this is what you'd expect to see in a man who puts himself forward for election to the highest office in the nation: a record of accomplishments, of good and bad qualities, based on which you make a measured evaluation and vote. Whatever else can be said about Senator McCain, we know who he is. I realize that this is an ad hominem rather than a cogent argument. Still, since I've spent the entire weekend defending Senator Obama's right to defend his wife -- and the basic nobility of such a defense -- I think I can take a moment to point to something that really bothers me about the man. Americans are beginning to notice Obama’s elevated opinion of himself. There’s nothing new about narcissism in politics. Every senator looks in the mirror and sees a president. Nonetheless, has there ever been a presidential nominee with a wider gap between his estimation of himself and the sum total of his lifetime achievements? That last bit is probably fair, in spite of his more recent work: but it is all the more astonishing given that he was allowed to write a memoir instead of the book he was contracted to produce, which was to be a book on race relations. He was permitted to write the memoir at the age of 28. For which memoir he was given an advance of $40,000. After he missed his deadline. Oh, and he took five years to finish the memoir of a 28 year-long life, but they never asked for the money back. I can forgive the man's own sense of entitlement or arrogance or whatever it is: the world has been handed to him on a platter at every moment. He's never done anything, but he's never had to do anything. For whatever reason, people have rushed to him to lay flowers at his feet. He's 28 years old, doesn't grasp what an opportunity he's being given in being offered a contract with Simon & Schuster, blows his deadline, and then turns in a memoir instead of the work he promised to produce? Hey, no problem -- here's forty grand. He hasn't updated his awareness on Iraq in two years, and so at the last minute he goes out with a Congressional Delegation to meet with some of the generals he's never talked to as a Senator? Every network sends their anchor along to cover the historic trip. McCain -- a long-term Senator and veteran, and the guy who made the Surge -- goes out while the war is still hot, and walks the Iskandariyah market without body armor? The wire services don't even send anyone. The only photos of the trip are from military public affairs. His wife gets her salary tripled after he wins election to the Senate, and shortly thereafter he earmarks her employer a million dollars? Hey, now, so what? That's the politics of hate, man. The hospital says she deserved it, so obviously it's just what's fair. We all know how it works. 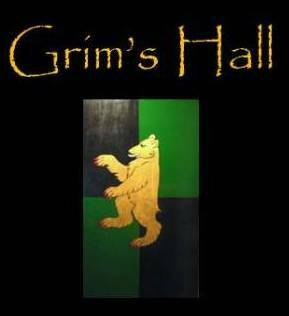 Grim's Hall readers are smart and work hard. Some of you got a 300% raise that year, right? No? Ever? You're getting your start as a mere "community organizer." Your chief initiative is to get better housing for your constituents. The housing is underbuilt and has to be condemned, and your chosen vendor goes to prison on Federal corruption charges. This is seen in no way as a disqualifying factor to your pursuit of higher office. Really, it's not interesting. Especially not when taken together with that earmark thing. Oh, and the guy who went to prison helped you buy your house. And donated to your campaign. All of your campaigns. I had the same sense when President Bush proposed Julie Myers as the head of ICE, when she was manifestly unqualified -- but related to a key Bush supporter. (Some of you will remember me ranting about that repeatedly and at length.) Myers, though, was clearly a Bush powerplay: the Republicans protested loudly, but finally fell in line. They had used up their political capital killing his SCOTUS nomination. In the case of Senator Obama, the whole world seems to be in on the game. It's one thing for a Senator or a Presidential candidate to have high and low moments, pluses and drawbacks. That's normal. It's astonishing to watch someone who, since he was a man of 28 and even younger, has been given everything: whose failures have been rewarded with cash advances, praise, adulation, and higher office.